Than Thein (left) and Matt Galat take you on a video tour of Ohio-based coral farm Tidal Gardens. How does someone go from being a successful business lawyer, only to throw it all away to instead become a landlocked coral farmer in the middle of Ohio? Find out as worlds collide in this unique on-location video. CORAL Magazine contributor and proprietor of Tidal Gardens, Than Thein, was interviewed earlier this year by one of our favorite expat reef keepers, Matt Galat of the YouTube channel JaYoe Nation (and more specifically, the Matt’s Reef Tank YouTube series, which covers reefkeeping in China but also roves wherever a subject catches his eye). 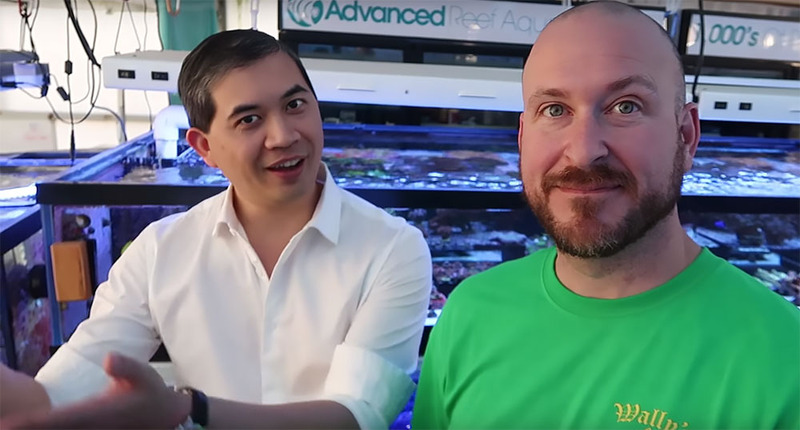 Matt and Thein have known each other for years leading to a candid experience; Galat does an excellent job of bringing you inside the Tidal Gardens greenhouse, talking about the coral farm and the challenges Thein faces. BONUS – Galat Interiews Thein in his Vlogger 1 on 1 series. The result? Everything from a brief history of how Thein started out his YouTube Channel, to how he captures such pristine video of corals on at extremely close range. Yes, you’ll get to see the sliders, the cameras, and the lenses Thein uses to produce his unforgettable footage. Hint: It is not cheap, and it takes patience and a sturdy tripod to do it right.